This is a small painting that I would like to paint up into a larger piece at some point. It is a an auction donation piece to benefit this year's Wallowa Valley Festival of the Arts, June 4-6 in beautiful Joseph Oregon. This view was painted just outside Joseph in the Wallowa Valley. 12x6 Oil on Linen. Hi Sharon: You know I'll bid on this one unless your entered pieces catch my eye first! Don't forget the April 2nd cutoff for the artist entry forms. Also, there's now a page on Facebook for the Wallowa Valley Festival of Arts. We've been posting about artists who have entered. Hi Sharon! So excited to find your blog after all these years! Your paintings are beautiful and interesting. 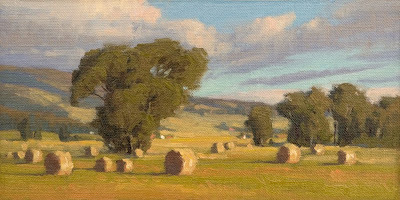 Always a country girl at heart, "Summer Haying" has such a beautiful softness and simplicity that appeals to me at a deep level. Remembering all the fun we had together as kids! Especially the summers! Best wishes to you and your continued success as an artist. I can see that it brings great joy and fulfillment to your life.